• Millennium Nucleus Center for the Analysis of PDE NC130017 of the Chilean Ministry of Economy. • Center for Mathematical Modeling, Universidad de Chile. • FONDECYT projects 1140225, 1150038, and 1161098 of the Chilean Ministry of Education. • Workshop realizado con el aporte de la Vicerrectoría de Investigación de la Pontificia Universidad Católica de Chile. who made it possible to organize this conference. Folding of viral DNA in a capsid yields a highly ordered liquid crystal phase subject to extreme pressures. Two main mechanisms contribute to the large pressure as well as shearing stress in the domain: high bending resistance of the DNA and electric effects due to the large negative charge of the DNA molecule and environmental ions. We construct a phenomenological model of genome packing and show that it yields qualitative and quantitative agreement with the packing configurations of known viruses. First, we rely on cryogenic images of viruses and molecular dynamics simulations to argue that the packed genome forms a biaxial smectic arrangement with an isotropic core, this being the result of the high bending resistance of the DNA molecule. The liquid crystal director field obtained from the analysis is now the tangent field of a filament representing the axis of the DNA ribbon. We study the role of liquid crystal defects and knots in the packing. Available information to determine the material parameters of the model include: length of the genome, capside geometry, cryogenic imaging, density curves, pressure and ejection speeds measurements. However, the mechanical model alone is not sufficient to capture all the packing features. Additionally assuming that the DNA and the surrounding water, that sustains the ions, are in a gel state, allows us to incorporate the chiral charge distribution of the viral genome and the environmental electric charges, all of which, together with the mechanical forces, contribute to the large osmotic pressure observed (about 60 atmospheres). These configurations, corresponding to gels with high residual stress, yield free boundary problems that bear analogies with those of liquid crystal droplets and elastomers. This is joint work with Javier Arsuaga and Mariel Vazquez. The ancient art of paper folding, or origami, has evolved into a rich interdisciplinary scientific field. It offers the possibility for new meta-materials whose overall mechanical properties can be programmed by acting locally on each crease allowing reprogrammable configurations and deployable structures. Starting from a thin plate and knowing the properties of the material and the folding procedure, one would like to determine the shape taken by the structure at rest and its mechanical response. This talk is devoted to review experimental and theoretical work on the physics and mechanics of folded structures made by our group. Sobolev maps that are orientation preserving and do not exhibit cavitations are locally invertible, and this property is stable along weak convergence. I will use this feature to show weak lower semicontinuity of functionals defined in the deformed configuration and functionals involving composition of maps. In particular, I will apply those results to prove existence of minimizers in some models for nematic elastomers. Origami artists are experts in transforming an initially flat sheet into a delicate 3D structure through manual folding. May a sheet fold spontaneously into a programmed shape? A thin template can for instance wrap a droplet of water under the action of surface tension and reopen when an electrostatic field is applied. Charging a soft capacitor also results in an extension of the dielectric membrane. Similarly, swelling, pneumatic inflation or, more generally, differential growth can induce out-of-plane deformations of a flat sheet. I propose to review the physical ingredients involved in these transformations. A macroscopic garden hose becomes unstable when the water flow is high enough. We analyzed if this mechanism persists at the micro-scale where the flow becomes more and more laminar as we reduce the hose physical dimensions. It is experimentally demonstrated that indeed this is the case. In passing by, a long standing biological problem is solved: How the velvet worm fast oscillates its papillae and weave a net in a few microseconds. A minimal model and a physical simulacrum show that this fast oscillatory motion is the result of an elasto-hydrodynamic instability driven by the interplay between the elasticity of oral papillae and the fast unsteady flow during squirting. Several applications that can be implemented using this instability are proposed, ranging from high-throughput droplet production, printing, and micro-nanober production among others [1, 2]. Kang, E. et al. Digitally tunable physicochemical coding of material composition and topography in continuous microbres. Nature Materials 10, 877-883 (2011). Concha, A. et al. Oscillation of the velvet worm slime jet by passive hydro-dynamic instability. Nature Communications 6 (2015). Acknoledgements: Partial support from Conicyt PAI 79112004 and Fondecyt 11130075 is acknowledged. Imposing a curved shape on a solid sheet generates in it elastic stress. This familiar motif is a consequence of Gauss’ theorema Egregium, which posits that there exists no isometric map between two surfaces of different Gaussian curvatures. This coupling between geometry (curvature) and mechanics (stress) underlies the morphological richness observed in solid sheets, and their nontrivial response to exerted forces. In this talk I will propose a unifying framework for predicting stresses and morphological transitions in elastic sheets. I will discuss a few representative examples, which demonstrate how Gaussian curvature can (or cannot) be accommodated on a solid sheet. Many equations describing the dynamics of soft matter are derived from a variational principle proposed by Onsager in his celebrated paper on the reciprocal relation [1, 2, 3]. This includes Stokes equation for hydrodynamics, Smoluchowskii equation for Brownian motion, Cahn-Hilliard equation for phase separation (model H), elasto-diffusion equation for gels, Leslie-Ericksen equation for liquid crystals etc. Here I discuss how this principle is useful in solving practical problems and the implication of this principle [4 - 8]. The growth of plant, fungal, and bacterial cells depends critically on two processes: the deposition of new wall material at the cell surface and the mechanical deformation of this material by forces developed within the cell. To understand how these two processes contribute to cell growth, we have undertaken a biophysical analysis of tip growth morphogenesis. Tip growth is a fast and robust elongation process observed in many specialized cells such as root hairs, fungal hyphae, and pollen tubes (see Figure). Our experimental and modelling work has revealed that a few basic biophysical principles can explain many of the key features of tip growth. We first showed that the seemingly obscure pattern of wall expansion in these cells can be accounted for by linear mechanical relations incorporating in a simple way architecture of the cell wall. We also analyzed the relationship between the velocity of the growing tip and the force that the cell applies to penetrate their environment. Again, a simple balance of forces between the internal pressure of the cell and the resistance of the environment explains all of the main features of the cell’s response. An elegant model of tip growth morphogenesis emerges from these results. Growth is essentially a mechanical process that is controlled, at the cellular level, by the internal turgor pressure of the cell and the polar deposition of new wall material. The statistical properties of thin elastic plates under an external forcing exhibit several similarities with Hydrodynamic turbulence. In the last decade, experiments and numerical simulations have reported an energy flux along scales with Kolmogorov-like energy spectrum, together with regimes where large fluctuations lead to intermittency. In this talk I will first review the statistical properties of thin elastic plates in the limit of weak nonlinearity in the context of Föppl - von Kármán equations. I will discuss the result obtained within the wave turbulence theory, its validity and comparison with numerical simulations and experiments. In the second part of this talk I will discuss the strong turbulence regime. I will show a new analytical result for a third order structure function (third-order moment of field space difference). Our result is the equivalent to the well known Kolmogorov's 4/5-law in hydrodynamic turbulence. I will describe a mathematical model for nematic electrolytes, in which the liquid crystalline component is described in terms of a second-rank order tensor. The model is based on a variational principle and extends the previously developed director-based theory to account for presence of disclinations and possible biaxiality. I will also present several simple but illustrative examples of liquid crystal-enabled electro-osmotic flows around a stationary colloidal particle in a nematic electrolyte. The simulations show a strong dependence on the director configurations and on the anisotropies of dielectric permittivity and electric conductivity of the nematic. The mechanics and fracture of thin films is an interdisciplinary research subject that has undergone a notable expansion in recent years in disciplines like physics, biophysics, and applied mathematics. At the same time, thin films are broadly used in engineering and industry, in many different applications. It is therefore of paramount importance to understand the mechanisms that control their failure. As regards fracture, the easy bending of thin films without too much stretch gives rise to extremely robust crack path. In so-called tearing configurations, where the crack is subject to a combination of in-plane tension and out-of-plane shear, with large out-of-plane displacements, the prediction of crack path can be formulated as a variational problem, in the case of very thin, isotropic, and brittle films. Many experiments are conducted on commercial films (thickness ~10 - 100 microns), which are easier to handle than ultra thin films (~ 0.1 - 1 microns). Manufactured films however do have a finite thickness, they are biaxially stretched, hence are anisotropic, and may flow plastically at lengthscales comparable to the size of the sample. I will show through a series of experiments how these properties can dramatically change the behaviour of a system of cracks. I will discuss and compare some aspects of approaches to thin plates that have arisen recently in the soft matter physics community. There are at least two metric tensors relevant to any description of elasticity, and different choices have been made about how to employ these objects. The choices affect, among other things, the definition of bending energy and the simplicity of the equations. These issues have already been partially addressed in the engineering mechanics literature. In this talk we will give an introduction to the discontinuous Petrov-Galerkin method (DPG) with optimal test functions. We aim at showing the flexibility of its framework. Main advantage of the DPG method is that, for singularly perturbed problems, it can deliver robust control of unknowns in a given norm. In the case of singularly perturbed problems, proving robustness of the method boils down to a stability analysis of the corresponding adjoint problem. Such an analysis is also important for non-perturbed problems in order that the error be controled in a given norm. The focus of this presentation is on these adjoint problems and to show the similarities for different situations. We discuss applications to problems like convection-dominated diffusion, reaction-dominated diffusion, a hypersingular boundary integral equation, and the heat equation. We present some numerical results that underline robustness and convergence properties of the method. This presentation is based on joint works with Leszek Demkowicz (U of Texas at Austin, USA), Michael Karkulik (U Técnica Federico Santa María, Chile), Thomas Fuehrer (UC, Chile), and Jhuma Sen Gupta (UC, Chile). Nematic liquid crystals (NLCs) of achiral molecules or racemic mixtures form flat films and show uniform textures between circular polarizers when suspended in TEM grids and merged under water. On addition of chiral dopants to the liquid crystal the films exhibit concentric ring patterns and radial variation of the birefringence color. We show this is related to a biconvex shape of the chiral liquid crystal film and the rings are due to interference. Our analysis show the films have a spherical lens shape and they can be used for optical imaging similar to the microlens arrays of the compound eye of insects. The curvature radii of the biconvex lens array are in the range of few millimeters. We propose that the unwinding of the helical structure at the grid walls drives the lensing. The relation between the lens curvature and the helical pitch, the twist elastic constant, and the interfacial tension of the material is derived. We argue that these spontaneously forming microlenses can be used for various sensors. Liquid crystal shells: What is left to learn? How can we apply them? The first liquid crystal shells were produced in the Weitz lab, using a microfluidic technique, one decade ago . Since then a number of groups around the world have adapted the production technology, and shells of nematic [1-6], cholesteric [7-8], smectic-A [5-6,9], and smectic-C  types have been explored, with varying combinations of boundary conditions, and experiments have been complemented with computer simulations [11-12] and theory [3, 13-15]. A major driving force for these studies is the spontaneous appearance of defects on shells with (partial) tangential alignment, arising due to the spherical topology. Another fascinating effect is the photonic cross communication arising between multiple shells of short-pitch cholesteric liquid crystal , where the curvature and the internal periodic structure interplay to generate regular but surprisingly complex multi-colored patterns. Shells can be polymer-stabilized  or polymerized into liquid crystal elastomers , allowing long-term stability and giving further functionality like mechanical actuation. This development makes devices using liquid crystal shells feasible, and among the proposed application areas are micropumps , sensors  and physical unclonable function tokens for secure authentication . From a fundamental physics point of view, much has been learnt concerning the stable configurations of topological defects on the shells [1-3,5-6,10-15,17], as well as their trajectories when the shell is out of equilibrium [18-19]. Still, many questions remain to investigate, for instance concerning to what extent the shells, which still require a layer of stabilizers on the inside and outside, can be considered curved 2D systems. In this talk we will survey the activity during the first decade of liquid crystal shell research and try to identify stimulating questions for the next decade, in particular in the context of collaboration between experimentalists and theoretical physicists and mathematicians. Fernandez-Nieves, A. et al. Phys. Rev. Lett. 99, 157801 (2007). Lopez-Leon, T. & Fernandez-Nieves, A. Phys. Rev. E 79, 021707 (2009). Lopez-Leon, T., Koning, V., Devaiah, K. B. S., Vitelli, V. & Fernandez-Nieves, A. Nat. Phys. 7, 391-394 (2011). Noh, J., Reguengo De Sousa, K. & Lagerwall, J. P. F. Soft Matter 12, 367 - 372 (2016). Liang, H.-L., Schymura, S., Rudquist, P. & Lagerwall, J. Phys. Rev. Lett. 106, 247801 (2011). Lopez-Leon, T., Fernandez-Nieves, A., Nobili, M. & Blanc, C. Phys. Rev. Lett. 106, 247802 (2011). Uchida, Y., Takanishi, Y. & Yamamoto, J. Adv. Mater. 25, 3234-3237 (2013). Geng, Y. et al. Sci. Rep. 6, 26840 (2016). Noh, J., Henx, B. & Lagerwall, J. P. F. Adv. Mater. 28, 10170-10174 (2016). 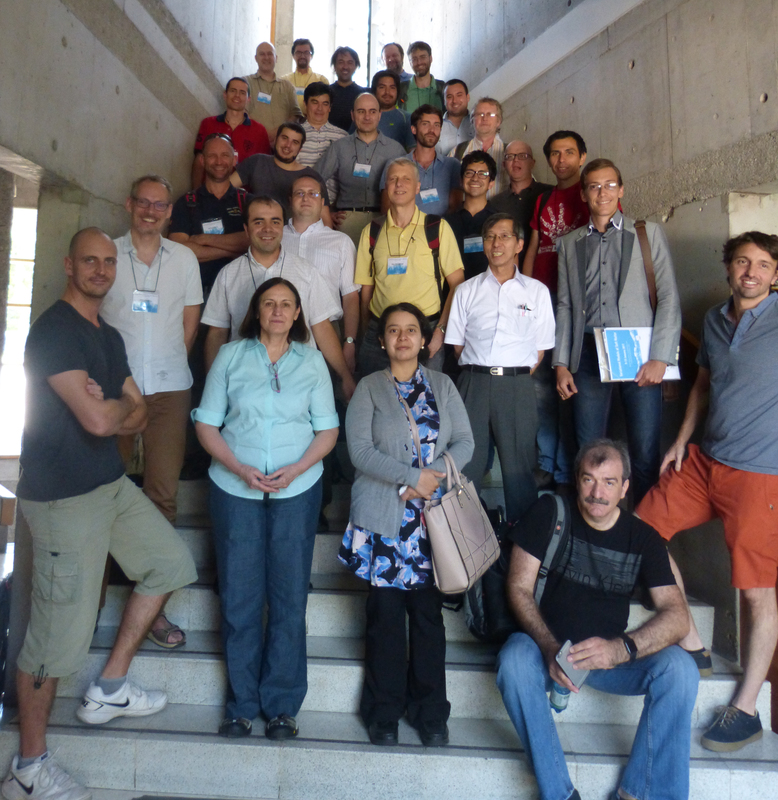 Liang, H. L., Noh, J., Zentel, R., Rudquist, P. & Lagerwall, J. P. F. Philos. Transact. A Math. Phys. Eng. Sci. 371, 20120258 (2013). Skacej, G. & Zannoni, C. Phys. Rev. Lett. 100, 197802 (2008). Bates, M., Skacej, G. & Zannoni, C. Soft Matter 6, 655-663 (2010). Koning, V., Lopez-Leon, T., Darmon, A., Fernandez-Nieves, A. & Vitelli, V. Phys. Rev. E 94, 012703 (2016). Gharbi, M. A. et al. Soft Matter 9, 6911-6920 (2013). Koning, V., Lopez-Leon, T., Fernandez-Nieves, A. & Vitelli, V. Soft Matter 9, 4993-5003 (2013). Fleischmann, E.-K. et al. Nat. Commun. 3, ARTN: 1178 (2012). Liang, H.-L., Zentel, R., Rudquist, P. & Lagerwall, J. Soft Matter 8, 5443-5450 (2012). Lopez-Leon, T., Bates, M., A. & Fernandez-Nieves, A. Phys. Rev. E 86, 030702 (2012). Sec, D. et al. Phys. Rev. E 86, 020705(R) (2012). Coupling of activity and orientational order is a quintessential feature of many dynamic out-of-equilibrium systems. We present an experimental system in which the activity and orientational order can be controlled independently of each other. The system represents a dispersion of swimming bacteria (B. Subtilis) in a lyotropic chromonic liquid crystals. Nematic ordering imposes limitations on the dynamical behavior of the bacteria, while the activity of bacteria causes a cascade of director instabilities leading to topological turbulence. We discuss regimes when the bacteria swim parallel to the director and perpendicular to it, as well as the flow dynamics in the director field with imposed topological defects. The work is supported by NSF DMS-1434185 and by the Petroleum Research grant PRF#56046-ND7 administered by the American Chemical Society. We study global minimizers of an energy functional arising as a thin sample limit in the theory of light-matter interaction in nematic liquid crystals. We show that depending on the parameters various defects are predicted by the model. In particular we show existence of a new type of topological defect which we call the shadow kink. Its local profile is described by the second Painlevé equation. As part of our analysis we give new proof of the well known result of Hastings and McLeod. We study nematic liquid crystals in prototype two-dimensional geometries, namely, a rectangle and an annulus, within the continuum Oseen-Frank theory. Our work is motivated by recent experiments in the Aarts group, on viruses in severely confined rectangular and annular chambers, with tangent or planar boundary conditions, that exhibit orientationally ordered spatio-temporal patterns with and without defects. For a rectangular geometry, we derive analytic expressions that approximate the experimentally observed diagonal and rotated states and the leading-order energies that separate the defect energies from the bulk distortion energies. For an annular geometry, we consider the defect-free state and states with regularly spaced boundary defects separately. Both types of states are observed in experiments. We compute energy estimates in terms of the number of boundary defects and show how states with boundary defects may be energetically preferred for certain model situations, when we vary either the geometry, material anisotropy or anchoring strength on the boundaries. We produce stability diagrams that capture these effects and the instability of the defect-free state to different kinds of symmetry-breaking perturbations. Our theoretical work provides a foundation for the experimental observations, at least in qualitative terms. This is joint work with Alex Lewis, Peter Howell and Dirk Aarts. We define a class of Sobolev deformations that are orientation-preserving and suitable for models in nonlinear elasticity. We show an inverse function theorem for this class. We give applications to existence results in variational models in Mechanics with low coercivity. We also point out how this technique is also useful in models whose energy involves both reference and deformed configurations. Joint work with M. Barchiesi and D. Henao. In this lecture I will review the variational nature of the dynamics of strong deformed thin elastic plates, known as the Föppl von Kármán (FvK) equations. In a first part I will summarize the variational structure of the FvK equations; next, I will discuss the propagation of nonlinear structures; and, finally I will discuss the longtime behavior of elastic plates. We start with a finite element method (FEM) for computing equilibrium configurations of liquid crystals with variable degree of orientation (the Ericksen model). We review the degenerate elliptic model, discretization strategy, and stable gradient flow scheme to compute minimizers. Next, we extend the method to account for colloidal inclusions by using a "phase-field" to mark the inclusions (holes). We also include external force fields. Simulations in 2-D and 3-D are presented to illustrate the method, including the Saturn ring defect, "Freedricksz Transition,” and combined effects. Many models of polymers, fluid mixtures, and fluids with multiple phases, consist of the momentum equation coupled to equations for internal variables which characterize fine scale structures and phases formation. Examples include the Ericksen--Leslie model of liquid crystals with nematic and isotropic regions, the Oldroyd--B fluid, and fluids with dilute colloidal suspensions. The variational structure of these equations models the subtle balance between inertia, transport, and dissipation. This talk will illustrate how the underlying variational structure of these equations can be used to develop stable numerical schemes to simulate these systems and the corresponding numerical analysis. 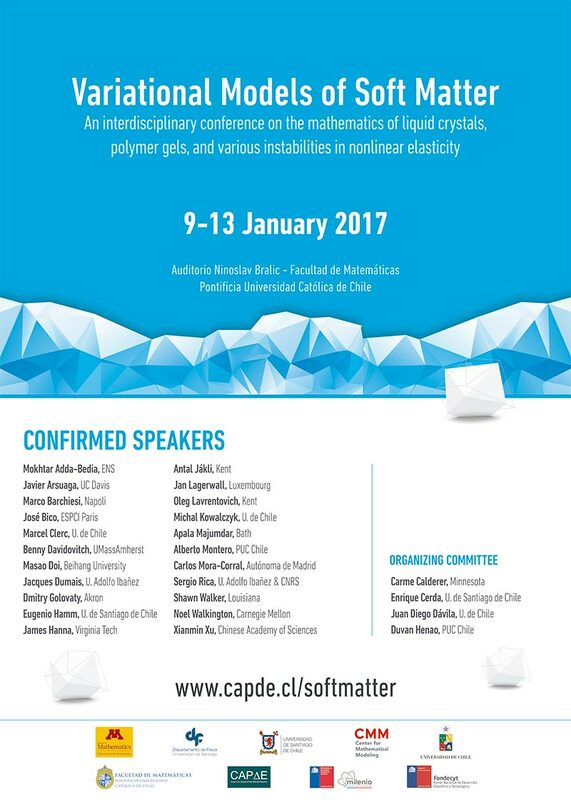 9:00 - 9:45 Jan Lagerwall Experimental Soft Matter Physics, Luxembourg Liquid crystal shells: What is left to learn? How can we apply them?